Naomi Imatome-Yun. The Spruce Eats, 2016. 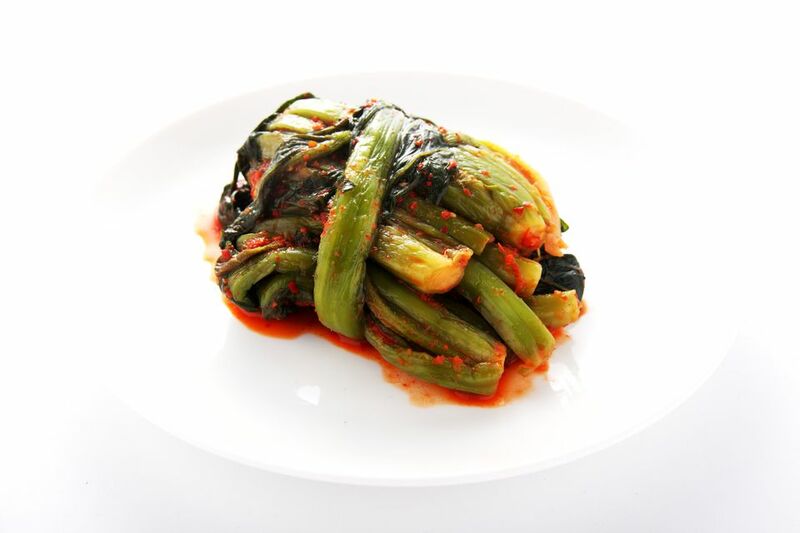 Scallion kimchi goes a long way, so you don't have to make a ton to have a nice dish on hand and ready to round out your Korean meals. It also stores well in the fridge, allowing you to make a ton in advance for leftovers. If the scallions are still wet from your wash, then pat them dry. In a large mixing bowl, pour fish sauce over scallions, coating them well. Let sit for about 20 to 30 minutes. While the scallions are sitting, in a saucepot over medium, combine the water and sweet rice flour. Stir gently. Heat until bubbly. Turn off the heat and let it cool. Make a seasoning paste of your pureed pears, garlic, and ginger by mixing them well. In a mixing bowl, combine your seasoning paste with the kochukaru, sesame seeds, sugar, and vinegar. When the sweet rice paste has cooled, mix it in with the spicy seasoning mixture. Mix thoroughly. Pour the combined seasoning mixture over the scallions in the fish sauce. Mix, making sure the scallions are coated with the sauce. In a glass jar, place the scallions neatly, folding when necessary. Add in small bunches to arrange. Screw on lid loosely and let sit at room temperature. Let the kimchi ferment for a few days. When it's ready to eat, store it in the refrigerator.